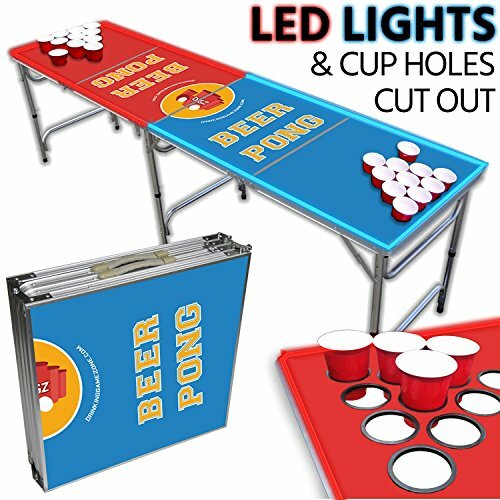 Here are some fun examples of popular games that can be played using our Beer Pong Tables. Team up in pairs of two for 2 on 2 for the classic American competitive drinking game of Beer Pong. A staple in many university students college careers, this match pits friends against each other as they compete to throw ping pong balls across the table and into each others red plastic solo cups, filled with either water or beer. Play with either 6 or 10 cup racks - first to make all of their opponent's cups wins! House rules when it comes to re-racks and redemption. This is a classic drinkinggame where any number of people can play, making it a great social event for adult and 20-something yr old parties. Everyone splits into two teams and lines up on opposite ends of the table from each other. Determine which pair will start the game off with an up/down/up cheers of their cup before drinking the liquid in it and racing to flip it off the edge of the table from right-side up to face down. Once a cup lands face down, the next person in line for that team races to do the same and ultimately to flip their cup as fast as possible. First team to drink & flip all of their cups is the winner. Very similar to beer pong where two teams of two face off against each other, except that each player gets a single cup placed on the corner in front of them that they have to protect. If a pong ball rims off the lip of the cup and bounces, they must catch it before hitting the ground of they lose a quarter. If a cup is a made, they lose a half. Once they lose all 4 quarters, they are out, and can play defense for their teammate. If you have any questions about this product by Drinking Game Zone, contact us by completing and submitting the form below. If you are looking for a specif part number, please include it with your message.